Since our days as students at the Juilliard School (in the early 70s) we have been performing and teaching on the recorder. 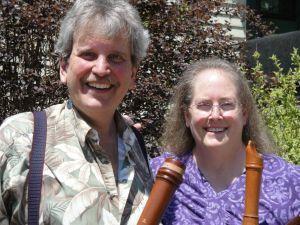 For both of us our interest in recorder started long before that, Richie began playing at the age of 7 and Elaine at the age of 9. Although we now live in the Adirondack mountains of upstate New York, we still teach in New York City once a month. We present numerous workshops throughout the year both in New York City and the Adirondacks. Locally we give private and group lessons, coach the Adirondack Recorder Band, perform and volunteer our musical services in church, at the local farmers market and can be heard around Warrensburg,NY during most town-wide happenings. We regularly exhibit at recorder workshops held in the Northeast. If you would like to browse through music or visit with us in person, please see our schedule. Richie eventually got into sales because he loved sheet music; he was always reading catalogues to see what was new. He became the largest single purchaser of recorder music at Terminal Music in NYC and knew more about what was in stock than the owners. When a new sales person was needed they logically asked Richie (their best customer) to come work for them. Unfortunately Terminal went bankrupt. And for us as freelance musicians and teachers, life in NYC was becoming more difficult with rising living expenses. We went to our large body of students and said either it was time for us to leave NYC or get larger by expanding into sales. With the support of our students we raised $50,000 with which to open a retail store. We purchased the remaining stock from Terminal found a space to rent and opened for business. Finally, rents and cost-of-doing business in NYC forced us to move. The retail business was mainly mail-order so off to the north woods we went. If you have any questions please ask, because of our background we have in-depth "hands on knowledge" of both the music and instruments we sell.